CBI - China: Day 67 of 154 of the Japanese Invasion of Manchuria. Germany: An Anti-Comintern Pact is signed with Japan, which commits both to cooperate in defense against international Communism. Spain: Day 130 of 985 of the Spanish Civil War. Spain: Day 495 of 985 of the Spanish Civil War. CBI - China: Day 140 of 2,987 of the 2nd Sino-Japanese War. Day 103 of 106 of the 2nd Battle of Shanghai. Spain: Day 860 of 985 of the Spanish Civil War. CBI - China: Day 505 of 2,987 of the 2nd Sino-Japanese War. Day 43 of 81 of Japan's Operation GUANGDONG. London: An unexploded magnetic parachute mine dropped by Germany yesterday is successfully rendered safe and studied to unlock its destructive secrets. Five men set about the dangerous task which might well cost them their lives, but would, if successful, reveal the secret of the Nazi magnetic mine. First, they anchored the mine and then made pencil and paper rubbings of the external fittings. While waiting for the next low tide, special tools were improvised of non-magnetic material. One man told the rest of the party which fitting he was going to start working on and the sequence of his procedures. Thus, if the mine should happen to blow him up, the others would beware of that fitting when dealing with other mines. He removed the fitting in safety, and it appeared to be the detonator. So the whole party got to work on the other fittings. One by one they removed them, and then came a nasty shock when they discovered a second detonator. Twelve hours after they had arrived to make their investigation of this latest example of the Nazis ingenuity in devilish invention, they had sent the mine on its way to Portsmouth, harmless and with its secrets laid open before the experts. Approximately 350 parachute mines fell into the 215 mile long Thames and its docklands in the course of 1,400 German raids. 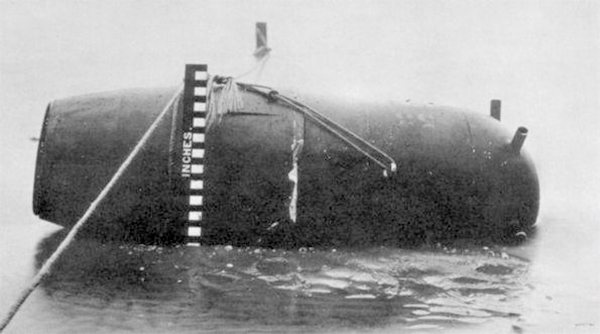 More than 100 ships were sunk in the river in the early months of the war, most taken out by magnetic mines, and nearly 100 aircraft were lost in the river during the course of the war. Germany surmised that to destroy the Thames was, essentially, to destroy England. Yet the river, and the country, somehow survived. Atlantic: German battlecruisers SCHARNHORST and GNEISENAU intercept a British convoy, sinking the armed merchant cruiser HMS RAWALPINDI, killing 265 men. ETO: RAF shoots down seven German aircraft over France. Poland: Yellow stars are required to be worn by all Polish Jews over the age of 10. Nazis choose the town of Oswiecim (Auschwitz) in Poland near Krakow as site of a new concentration camp. CBI - China: Day 870 of 2,987 of the 2nd Sino-Japanese War. Day 9 of 381 of the Battle of South Guangxi. ETO - UK: Day 79 of 258 of the Blitz. Southampton is hit hard by the Luftwaffe. Eastern Europe: Romania's leader Antonescu agrees to joins the Tripartite Pact. East Africa: Day 167 of 537 of Italy's East African campaign in the lands south of Egypt. CBI - China: Day 1,236 of 2,987 of the 2nd Sino-Japanese War. Day 374 of 381 of the Battle of South Guangxi. CBI - Thailand: Day 54 of 221 of the Franco-Thai War (Vichy France vs Thailand). Russian Front - Finland: Day 155 of 164 of the Battle of Hanko. The Soviets will be forced off their leased naval base. Russian Front: Day 155 of 167 of Germany's Operation BARBAROSSA. Russian Front - North: Day 77 of 872 of the Siege of Leningrad. Russian Front - Center: Day 53 of 98 of the Battle of Moscow. German troops are now only 35 miles northwest of Moscow. Russian Front - South: Day 25 of 248 of the Siege of Sevastopol, Crimean Peninsula. MTO - Libya: Day 228 of 256 of the Siege of Tobruk. Axis forces have destroyed the British 5th South African Brigade after days of tank battles around Tobruk. East Africa: Day 532 of 537 of Italy's East African campaign in the lands south of Egypt. CBI - China: Day 1,601 of 2,987 of the 2nd Sino-Japanese War. ETO - France: US 8th Air Force B-17s and B-24s hit the St Nazaire submarine base for the 5th time in two weeks. Russian Front - North: Day 442 of 872 of the Siege of Leningrad. Russian Front - North: Day 5 of 59 of the Battle of Velikiye Luki, near Leningrad. This stalemate does help ease the siege a little, but mostly it keeps German troops from being sent to other fronts. Russian Front - North: Day 203 of 658 of the Siege of the Kholm Pocket, USSR lays siege to the Kholm Pocket but the Germans hold out for a about a year and a half. Russian Front - South: Day 149 of 150 of Germany's CASE BLUE, the failed offensive to take the Caucasus oil fields. Russian Front - South: Day 94 of 165 of the Battle of Stalingrad, bloodiest battle in human history. Russian Front - South: Day 5 of 5 of the USSR's Operation URANUS. This quick, successful offensive drive will eventually turn the tide at Stalingrad. MTO - Tunisia: Day 7 of 178 of the Battle of Tunisia. Retreating before the British 8th Army (Montgomery), Panzer Army Afrika reaches El Agheila, Libya. US 12th Air Force provides air support. CBI - China: Day 1,966 of 2,987 of the 2nd Sino-Japanese War. PTO - Alaska: Day 170 of 435 of the Battle of Kiska, Aleutian Islands. The US and Canada will defeat the Japanese invaders. PTO - Malaya: Day 278 of 357 of the Battle of Timor Island, a long guerrilla war ending in Japanese victory. PTO - New Guinea: Day 5 of 66 of the Battle of Buna-Gona. PTO - Solomon Islands: Day 109 of 187 of the Battle of Guadalcanal. PTO - Australia: Japanese launch an air raid on Darwin. ETO - Germany: Day 6 of 135 of the Battle of Berlin (RAF bombing campaign). 383 aircraft pound Berlin. Russian Front - North: Day 807 of 872 of the Siege of Leningrad. Russian Front - North: Day 568 of 658 of the Siege of the Kholm Pocket. USSR lays siege to the Kholm Pocket but the Germans hold out for a about a year and a half. Russian Front - South: Day 92 of 122 of the Battle of the Lower Dnieper River, USSR. MTO - Italy: The Allies cross the Sangro (river) in strength. The US and Royal Air Forces provides air support. CBI - China: Day 2,331 of 2,987 of the 2nd Sino-Japanese War. Day 22 of 49 of the Battle of West Changde. PTO - Gilbert Islands: Day 4 of 4 of the Battle of Tarawa. Japanese end their resistance efforts on Tarawa. PTO - Gilbert Islands: Day 4 of 5 of the Battle of Makin. PTO - New Guinea: Day 66 of 219 of the Battle of Shaggy Ridge. PTO - New Guinea: Day 63 of 162 of the Battle of the Huon Peninsula. PTO - Solomon Islands: Day 23 of 295 of the Battle of the Bougainville Islands. USA: The Macy's Thanksgiving Day Parade is suspended for a third year in support of the war's need for rubber and helium. ETO - France: Day 115 of 284 of the Battle of Brittany. ETO - France: Day 70 of 236 of the Siege of Dunkirk. ETO - Germany: Day 66 of 145 of the Battle of Hürtgen Forest. Russian Front - Finland: Day 70 of 223 of the Lapland War. Finland and Russia have joined forces to kick the Germans out of Finland's most northern province. Russian Front - Center: Day 40 of 206 of the Battle of the Courland Pocket in Latvia. Russian Front - Center: Day 33 of 99 of the Siege of Memel, a border town of Lithuania and East Prussia. Russian Front - Center: Day 71 of 72 of the Battle into East Prussia and northern Poland. Russian Front - South: Day 26 of 108 of the Battle of Budapest, Hungary. Russian Front - South: Day 71 of 72 of the Battle of Belgrade, Yugoslavia. MTO: The Allies declare Macedonia on the Greek-Yugoslavian border, free of Germans. MTO - Yugoslavia: US 15th Air Force attacks tactical targets. CBI - Burma: Day 237 of 302 of the Chinese Salween Offensive. CBI - Burma: Day 10 of 31 of the Battle of Bhamo. CBI - China: Day 2,697 of 2,987 of the 2nd Sino-Japanese War. Day 221 of 259 of Japan's Operation ICHI-GO. PTO - New Guinea: Day 332 of 597 of the Battle of New Britain. PTO - New Guinea: Day 216 of 481 of the Battle of Western New Guinea. PTO - Palau Islands: Day 70 of 74 of the Battle of Peleliu (Operation STALEMATE II). PTO - Philippines: Day 35 of 299 of the 2nd Battle of the Philippines, aka the Liberation of the Philippines or the Philippines Campaign. PTO - Philippines: Day 35 of 73 of the Battle of Leyte. PTO - Philippines: Day 13 of 41 of the Naval Battle of Ormoc Bay. USA: Butter rationing comes to an end, leaving sugar as the only item that continues to be rationed in the United States. Sugar was the first food to be rationed, in the spring of 1942. The war with Japan cut off US imports from the Philippines, and cargo ships from Hawaii were diverted to military purposes. The nation's supply of sugar was quickly reduced by more than a third. To prevent hoarding and skyrocketing prices, the Office of Price Administration issued 123 million copies of War Ration Book One, which contained stamps that could be used to purchase sugar. The ration book bore the recipient's name and could only be used by household members. Stamps had to be torn off in the presence of the grocer. No sugar could legally be bought without stamps, and sugar rationing would continue until supplies returned to normal in 1947. Four War Ration Books were printed during WWII. In order to obtain a later book, the previous book had to be turned in. 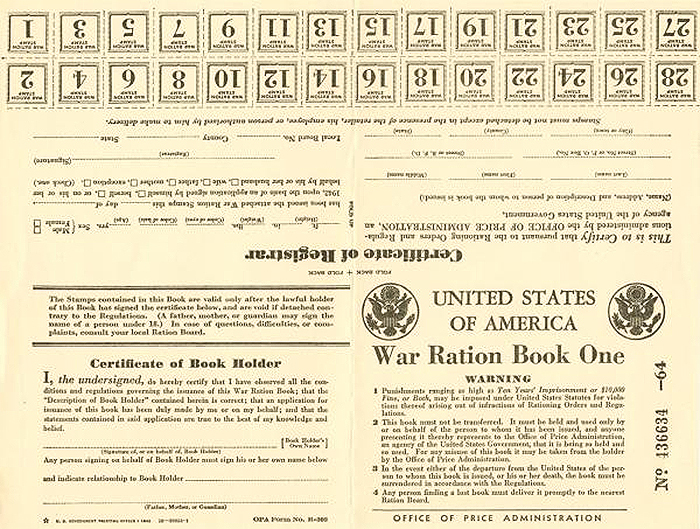 War Ration Book Five was prepared but never issued.